INCIDENT #1: At about 8:03 AM on Monday, April 23, 2018, officers assigned to District A-1 (Downtown) placed a suspect in custody after recovering two firearms in the area of 39 Boylston Street in Boston. The officers were advised by security staff at the Saint Francis Shelter that the suspect, Douglas Russell, 51, of Malden, had attempted to enter the building with two unloaded .22 caliber Butler Association handguns in his backpack. Officers placed the suspect in custody without incident after confirming he did not possess a license to carry a firearm. The suspect will appear in Boston Municipal Court on two charges of Unlawful Possession of a Firearm. INCIDENT #2: At about 7:20 PM on Monday, April 23 ,2018, officers assigned to the District D-14 (Brighton) Drug Control Unit placed two suspects in custody and recovered a loaded firearm in the area of 64 Murdock Street in Brighton. The officers had performed a traffic stop as part of a drug investigation when they recovered a loaded .25 caliber Jennings model 25 handgun from inside the vehicle along with a medium sized bag of marijuana and over two thousand dollars in cash. The officers then arrested the operator, Jeky Ball, 20, of West Roxbury and the passenger, Kenny Romero, 23, of Randoph. Both suspects will appear in Brighton District Court on charges of Unlawful Possession of a Firearm, Unlawful Possession of Ammunition and Possession with Intent to Distribute Class D Drugs. INCIDENT #3: At about 7:29 PM on Monday, April 23, 2018, officers assigned to the Youth Violence Strike Force arrested two suspects on firearm related charges after responding to a call for shots fired in the area of Prentiss Street and Albert Street in Roxbury. Responding officers were able to locate and stop two individuals matching the given descriptions in the area of Columbus Avenue and Heath Street. Upon stopping the individuals, both were pat frisked for officer safety. 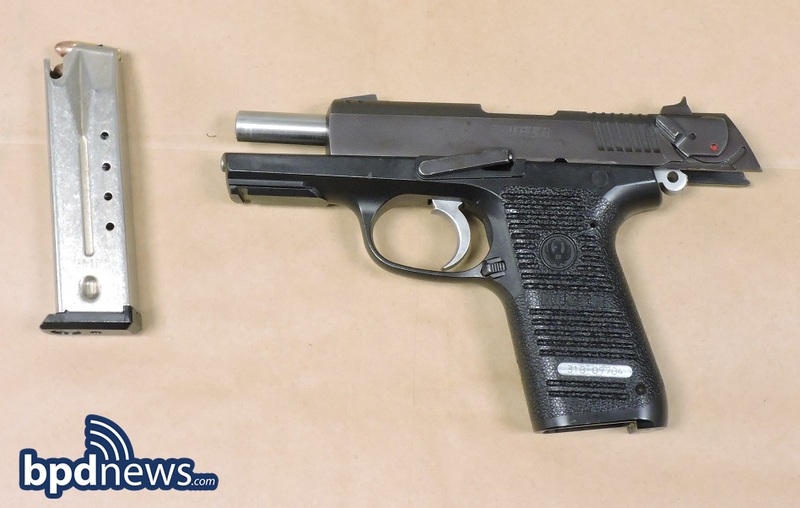 Officers recovered a loaded 9mm Springfield Armory model XD Tactical firearm from one of the suspects, later identified as a 16-year-old male from Boston, and a .380 caliber Cobra model CA380 handgun from the second suspect, later identified as Michael Robinson-Van Rader, 18, of Dorchester. Both suspects were then placed in custody without incident. The juvenile suspect will appear in Boston Juvenile Court on charges of Delinquent to Wit: Unlawful Possession of a Firearm and Unlawful Possession of Ammunition. Michael Robinson-Van Rader will be arraigned in Roxbury District Court and will be charged with Unlawful Possession of a Firearm. INCIDENT #4: At about 4:04 AM on Tuesday, April 24, 2018, officers assigned to District C-6 (South Boston) placed a suspect in custody and recovered a loaded firearm after responding to a call for a person with a gun in the area of 112 Southampton Street in South Boston. On arrival, responding officers observed a Massachusetts State Trooper performing a pat frisk of an individual, later identified as Joseph Lee, 35, of South Boston. Officers spoke with a male victim who stated that the suspect had threatened him while displaying a firearm. The victim stated that the suspect had discarded the weapon as officers arrived on scene. The officers went to the indicated location where they recovered a loaded 9mm Ruger P95 firearm at which time the suspect was placed in custody without incident. The suspect will appear in South Boston District Court on charges of Unlawful Possession of a Firearm, Unlawful Possession of Ammunition, Assault by Means of a Dangerous Weapon and Possession of a Large Capacity Feeding Device.